Manchester United were relatively quiet in this transfer market and David Moyes’s only high-profile signing was Marouane Fellaini for around £27 million. United’s centre-midfield problems have been highlighted for some time, but where exactly will Fellaini fit into Moyes’ plans? Last season 28 of Fellaini’s 31 appearances came as a second striker or attacking midfielder with just three coming as a central/deeper midfield player. What we can conclude from this is that, at least at Everton, Moyes saw Fellaini as a forward player, rather than a defensive-minded one. Everton were regularly seen aiming long balls or crosses into the box at Fellaini, who would act as a target man to bring the ball down and either shoot or try and bring another player into play. In this position Fellaini was relatively effective, scoring 11 times and getting five assists. Generally speaking he was a handful for opposition defenders and goalkeepers with his bullish style of play. In Everton’s 3-1 win over Reading last season in which Fellaini scored, he spent the large majority of his time in the final third of the pitch, spending very little of the game in the more defensive areas. Fellaini was primarily operating as a second striker, playing just off the central striker. Despite having 18.70% of his play in the middle area of the pitch, Fellaini made just one tackle in this game, which further points to the more advanced and freer role he has when playing off of a striker. His main strength which is his height was utilized excellently though, as he won 11 out of 16 headed duels. With Shinji Kagawa, Wayne Rooney and Danny Welbeck all capable of playing as the second striker/attacking midfielder in United’s set-up, it seems incredibly unlikely that Moyes will use Fellaini as an advanced player. Instead he’ll likely come into the side as a central midfielder alongside Michael Carrick. This season Roberto Martinez has played Fellaini in this central midfield position. Fellaini has dropped deeper and as such has been enjoying more of the ball than he did last season, averaging 73.3 passes per game at an accuracy of 89% (a vast improvement on last season’s 52.3 passes per game and 79% accuracy). Against Cardiff this was also notable with Fellaini attempting 66 passes. Fellaini enjoyed 91% pass accuracy in the Cardiff game and notably the bulk of his passes were from his own half, further demonstrating how he has been used as a defensive/central midfielder this season under Roberto Martinez. Of course, Martinez places a huge emphasis on possession and using the ball, but this shows that Fellani can adapt to a more technical-based system if required of him. 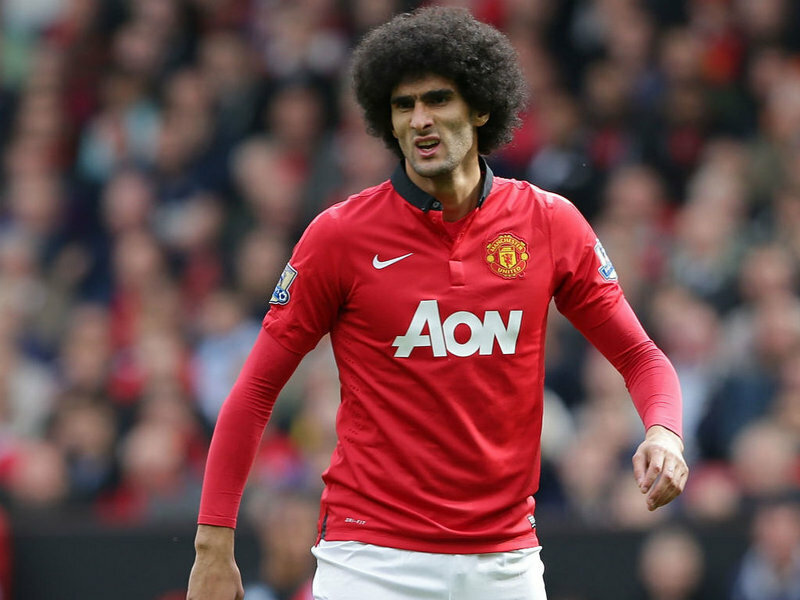 Fellaini has also been very combative this season, which bodes well for Manchester United fans. The big Belgian has won 4.3 tackles per game vastly more than Carrick or Tom Cleverley at an impressive 85% success rate. Not only that, but we can still see that he remains an impressive aerial presence, which can add a lot to Manchester United’s game in both penalty boxes. When he was used as a central midfielder last season he committed a lot of fouls, around 2.6 per game, more than any other Premier League player. This has important implications for Fellaini as a central midfielder, especially in a deeper role, as he is prone to a rash tackle and regularly fouls opponents who get past him. This season we can also see that he is fouling too regularly, something that he must improve at United, or he will risk giving away cheap free-kicks and being booked unnecessarily. Whilst Fellaini can provide an option as a second striker/attacking midfielder, it appears very unlikely that he’ll do this at Manchester United. He can provide a ‘Plan B’ as a long ball option in tighter games, something that the Old Trafford faithful might not take kindly to. On the whole however, he’ll be competing with Tom Cleverley for a place alongside Michael Carrick. Fellaini isn’t the fastest player but he is combative and can win the ball as he’s already shown this season for Everton in his three outings. The worry will be his tendency to give away a lot of fouls: if he wants to be a hit at United he will have to improve his disciplinary record. If he can continue to dominate the midfield, by winning tackles and continuing to show an improved pass accuracy, then there is no reason why he cannot succeed at United, regardless of whether he was the fans’ top choice or not. Is Kagawa becoming a waste at Manchester United?